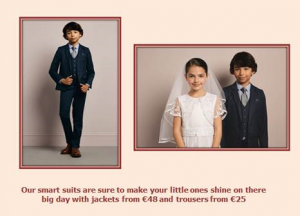 Make this special occasion even more memorable with the perfect first Holy Communion dresses for little girls and Communion suits for dapper boys. Let Debenhams dedicated personal shopper service help you find the perfect outfits for angelic little girls, super smart boys and proud parents. 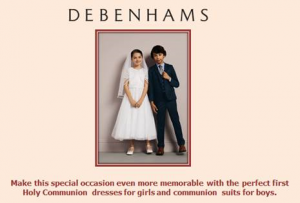 The impressive range of Communion outfits feature stunning dresses, the smartest of suits and a range of accessories for days when girls and boys need to look like ladies and gentlemen. 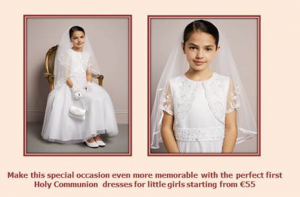 From Debenhams exclusive RJR.John Rocha range, this stunning dress is perfect for Communions and other special occasions. With delicate lace detailing across the top and a big bow at the back, this beautiful piece has been adorned with pretty sequin embellishments and has been designed with a mesh skirt with a netted underlayer for a fuller finish.